The game of croquet became popular in the 1860s because it was the only game where ladies and gentlemen could mix outdoors together. 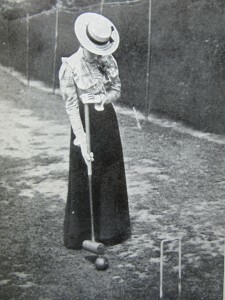 With the rising popularity of Lawn Tennis, croquet became less fashionable and many croquet lawns were converted into tennis courts (a tennis court is half the size of a croquet lawn). 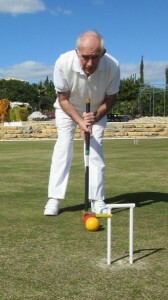 Basingstoke Croquet Club was founded in 1985 and has relied on support from the Borough Council for playing facilities. The first lawn was in the War Memorial Park, but this was taken for the tennis club; various other sites were tried before the Club became based at Down Grange in 1989. The Down Grange site was in use until 2017 but its complete lack of facilities and difficult location made it unattractive. On the initiative of Borough Council officers, we now have a very good working arrangement with the Thornycroft Bowls Club to share their green and clubhouse facilities. Our hope and intention is that we shall soon be able to link up with the adjoining Bowls Club, Howard Park (all within the same curtilage), and be able to use their green for croquet as well. This will enable us to better manage the growing demand for croquet and to play certain league matches at home where two lawns are required.